There are two updates to report in my current favorite case to watch, Bernie Kerik versus Joe Tacopina. The competing allegations are detailed here. 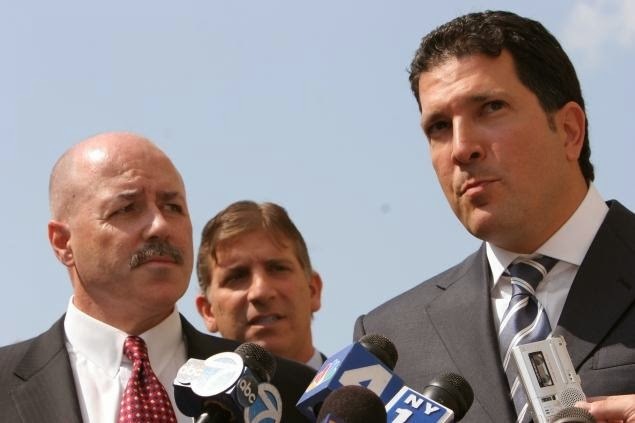 The short version: Kerik, a former NYPD Commissioner turned federal felon, is suing his former criminal attorney and close friend, Joe Tacopina, claiming Tacopina was informing on him to federal prosecutors, using information he gained as Bernie's friend and counsel. Tacopina is counter-claiming for defamation and charging that reporters from the Daily News conspired with Kerik to smear Tacopina. These are ugly and serious charges all the way around. All signs are pointing towards bare knuckle brawling with lots of scorched earth. So, the updates. First, the New Jersey federal court where Bernie filed his suit denied Tacopina's motion to dismiss, which he surely expected, but granted his motion for a change of venue. The case has been transferred to the SDNY and is now before Judge John Koeltl. Tacopina's deadline to answer the complaint or move again for dismissal is May 16, 2014. Second, Tacopina has added Judd Burstein to his defense team. In his April 10, 2014, letter to the Court, Burstein advised that he would be moving to dismiss the complaint and for sanctions against Kerik and/or his counsel, presumably if the complaint was not withdrawn before the motion to dismiss was filed. Burstein's appearance should dispel any doubt that Tacopina intends to vigorously fight this suit. Time to break out the popcorn and settle in for some entertaining litigation. The records you're talking about comprise the discovery the government turned over in the criminal case under a confidentiality order (and which Judge Preska just ruled compels Bernie to return them). Kerik can certainly subpoena those records from the government and slug it out w/the Justice Department before Judge Koeltl. Personally, I hope they're turned over. But I'm holding onto the popcorn. The discovery Bernie seeks is the discovery that proves the alleged investigation number 1 (into Tacopina/Fischetti fee splitting ) led to information (wire taps) contrary to Bernie Kerik. Bernie is mad, understandably so, by allegedging that the lawyer he is suing kept feeding information to a government investigation that Bernie was not told up front - he states his info was privleged - thus, the government is a party (so far unnnamed) to this litigation and should NOT have the right to hide under privledge when Bernie says his privledge communications was violated. In other words, you can't hide records to evade a judicial prosecution or investigation just b/c impropriety may be found - that is a no-no and may imply a cover-up - I am not saying that the case, but that is the implication from Bernie - He may be right. We don't know yet but he seems to have information. This is why we are supposed to have a "neutral" Judge. This is why the Judge needs to ASK questions, not copy and past the letter from the government who obviously might not want their work questioned - I believe as you also assert , Bernie must file for a subpoena and make them argue it out as this is a matter of the law and public interest as he also has a right to defend himself from the "defamation" with the truth, or else, the scales of justice are not fair to Bernie and this lawyer gain an unfair legal advantage - we all agree - release the records !! I have no idea where you get your info, but, if true, those tapes would be fascinating. I'm thinking it's like the scorpion and the frog parable. Bernie gets tapes that burn Tacopina and airs them out. Fun stuff. But then, Bernie ends up looking like crap as well. So why do it? Maybe it's his nature. Kerik's lawyer said today he's planning on subpoenaing the file, so here's hoping that the Court agrees that Bernie's need for the materials trumps any of the gov't's privilege arguments. "I know that lawyers in a civil litigation often try to convince prosecutors to pursue criminal cases against an opposing party and the purpose of this letter is to do just that..."
WOW, now that is one convoluted legal statement. Mike, any thoughts.....? Well, it's the forest - trees thing. Your pro-Bernie agenda is causing you to throw mud at any and everything tied to Tacopina, including insulting his attorney (who's really a very good lawyer). By the way, you should send me some sort of support for the sexual misconduct claims. Otherwise I'm deleting them. As for calling in the prosecutors: if Tacopina has evidence that Kerik's pleadings contain deliberately false statements, then /his attorney are protected. But as a strategy, well, people might disagree over that one. This is what it comes down to: did Tacopina violate Kerik's confidences? That's the question. The rest is just theatre. Of course, the theatre's the fun part, but there you go. New York regulates attorney-client sexual relations under the heading of Misconduct. Unlike the above jurisdictions, New York was the first state to regulate sexual relations of attorneys and clients in domestic matters. n44 Disciplinary Rule 1-102(7) provides that a lawyer or law firm [*142] shall not "in domestic relations matters, begin a sexual relationship with a client during the course of the lawyer's representation of the client." n45 Although strictly speaking attorney-client sexual relations in non-domestic matters are not prohibited, New York case law suggests that sexual relations in non-domestic relations cases may violate the code of conduct. n46 [*143] New York observes, as is the case in most attorney-client sexual relations, that most attorney-client sexual relations are initiated during domestic matters where a client is most vulnerable. New York's response to this problem was a per se rule against any sexual relations between client and attorney in matrimonial matters. Although other jurisdictions have drafted rules broader in scope, they emphasized that the sexual relationship must have an exploitative nature to be prohibited. Unlike those jurisdictions, but like Iowa and Minnesota, New York has a blanket prohibition on attorney-client sexual relations in domestic matters. As to your other question, where this information came from, I wish to advise you it has been widely reported on the website, GANGLAND NEWS.COM on June 17, 2011. Well, I don't know if any lawyer is working under a greater moral obligation to uphold the law than a major city police commissioner. So you'll forgive me if I read your posts as reflecting a certain bias. As for other allegations of bad acts by Tacopina, I'm not interested. It's the facts of this case that have piqued my curiosity. Parenthetically, Capeci is a reputable guy, but he's not saying there were sexual shenanigans. He's just reporting somebody else's claim, which, by the way, Capeci says was withdrawn once Tacopina refunded the client's fee. I have no dog in the fight or any desire to throw mud; I'm just interested in seeing how the litigation plays out. My favorite drink there was the cucumber water. Most cucumber water tastes like water with the tiniest morsel of cucumber taste, but not this water.